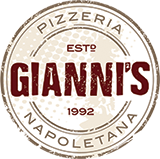 At Gianni’s Pizzeria we take pride in serving our customers only the freshest ingredients prepared daily. NOTHIN beats Fresh,Top Quality, AND affordable.We guarantee you’ll leave thinking about the next time you’re coming back! Its 100% worth every savory bite.